Protein is a key component of a healthy diet, so it's important to incorporate good sources of protein in your daily dietary plans. What are those good sources? Meat eaters have a distinct advantage in that their options are so much wider, but there are plenty of vegetarian sources as well. Protein is a fundamental "building block" of your body. Cut out protein, and you'll likely see muscle shrinkage and decreased metabolism, meaning your weight may stay the same but your body composition will change towards weaker and pudgier -- hardly a common desire. Furthermore, protein is necessary for a myriad of bodily functions ranging from oxygen transportation to catalysts for various chemical processes, although that's beyond the scope of this article. All meat has protein, but some are significantly lower than others in a gram-for-gram comparison. This is primarily because of the fat content (which in turn may pose problems), meaning you have to eat more to get the same amount of protein. Fowl, in general, pack a big punch per gram since they contain virtually no fat (assuming you go with the skinless variety). Brands and dishes vary a little, but the plain kind of chicken and turkey is usually pretty close to 4 protein calories per gram of meat with zero carbs and fat -- which is about as good as it gets. Ostrich can actually push the envelope a tiny bit more, but the prohibitive cost rarely makes this an attractive option -- just have another slice of turkey instead! 95 percent fat free ground is another good option. 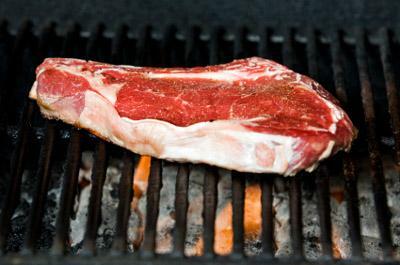 Grass-fed beef tends to be a little chewier, but makes up for it with slightly higher protein content. Ask your butcher for recommendations! Eggs are problematic in that the yolk packs quite a bit of fat and cholesterol, but it's also very high quality protein that your body can readily absorb. You can keep having omelets, but try substituting some eggs for egg whites (sold separately in small cartons next to the eggs in most stores) so that you only get one or two yolks into the mix. Lean fish such as tuna is like chicken and turkey -- all protein, virtually no fat or carbs. Others, like salmon, are high in fat and thus have lower gram-for-gram protein content. However, bear in mind that this fat is a completely different from bacon fat. Fish oil is packed with healthy omega-3 fatty acids, which many pay good money for in supplement form. In other words, this is a case where you should think of the big picture and not sweat the slightly lower protein content. Low-fat or no-fat milk products are generally good sources of protein, but beware of how they're processed. Many manufacturers like to tout the low fat content while jamming the yogurt or ice cream with sugar and/or questionable chemical concoctions. Read the labels carefully. Vegetarians have to work a little harder for their protein, but it is by no means a problem if you know where to look. Soy-based products used to mean just Tofu and spicy Tofu, but over the past decade we've seen many fake-meat products enter the scene that are quite tasty and work as a protein boost for most dishes. Bear in mind that soy in and by itself doesn't pack much flavor, meaning manufacturers often resort to excess quantities of salt to create it. Again, read labels carefully and keep the blood pressure in check. Soy isn't the only kind of bean with protein. Kidney beans, peas and many others also offer respectable amounts of protein. In addition, they also provide ample fiber, which slows digestion and has a proven good impact on your cardiovascular system. Nuts are often overlooked because of the fat content, but the fact is that peanuts, sunflower seeds and other common snacks are good sources of protein to boot. Finally, this is a relatively new addition: it's a kind of fungi, not unlike mushrooms, that can be modeled to imitate a wide range of meat products. While the feature itself is not that unlike soy, the result is often surprisingly decent and may even fool a meat-eater from time to time.